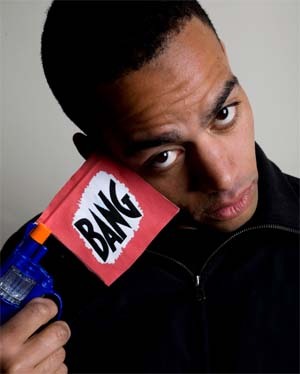 An underground rapper who worked with, among others De La Soul and Mark Ronson, Doc Brown put down one mic and picked up another in 2008 after working as a “slang consultant” on a Lenny Henry sitcom, written by Danny Robins and Dan Testell for Radio 4. Encouraged by various BBC producers, writers and audiences on the station, Doc played his first ever stand up gig in February 08, and rejoined Danny Robins with a cameo in Robins’ 2008 Edinburgh show, Dannyfest, in the Pleasance Courtyard. It was in Edinburgh 2008 that Doc reached the final of the annual So You Think You’re Funny? competition, and played the prestigious Tartan Ribbon event at The Pleasance Grand alongside Tim Vine and Stephen K Amos. He has since become a regular on the circuit, hitting the road in October 08, and is currently developing a number of different shows for television and radio. Doc has had 7 comedy shorts called “Get Rich” commissioned by MTV, which will be broadcast early 2009.